A few nights ago, I was whipping up a batch of Nutella Rice Crispie Treats (a post for another day) for Valentine's treats for my hubs and kiddos (special occasions only!). I was trying to open the cereal and it flew EVERYWHERE! I could not help but laugh - it was ridiculous how covered in crispies my kitchen was. I took a step back (a crunchy step) and looked at how disgusting my kitchen was. It has been a busy month with very little time to clean, so, I knew what my Saturday would entail. I'd like to share with you a few ways I use Young Living Thieves Cleaner in my own kitchen and show you the finished product.... the before picture was far too embarrassing to show online, sorry! Next up, I sprayed down the cabinet fronts with the same spray bottle I use for the counters and wiped them off with a clean towel. The oven seemed like a lost cause - somehow, a magnet was stuck to the bottom of one of my pans not too long ago while I cooked some Homemade Mac n Cheese. No, I have NO idea how that happened, but I do know it left quite a mess on my stovetop. Then there was the ring of burned on mess around the burners. My solution was almost too simple! I sprinkled on some baking soda, sprayed the baking soda with my Thieves spray bottle and let it sit for a minute while I wiped down the microwave. I used a Scotch Brite sponge and just a little bit of elbow grease (it was surprisingly easy) and got the burnt on ring right off. Finished it off with a spray or two of Thieves cleaner and a clean towel - it cut through the grease from frying bacon, the burnt on mess, AND left my ceramic stove top clean and shiny. 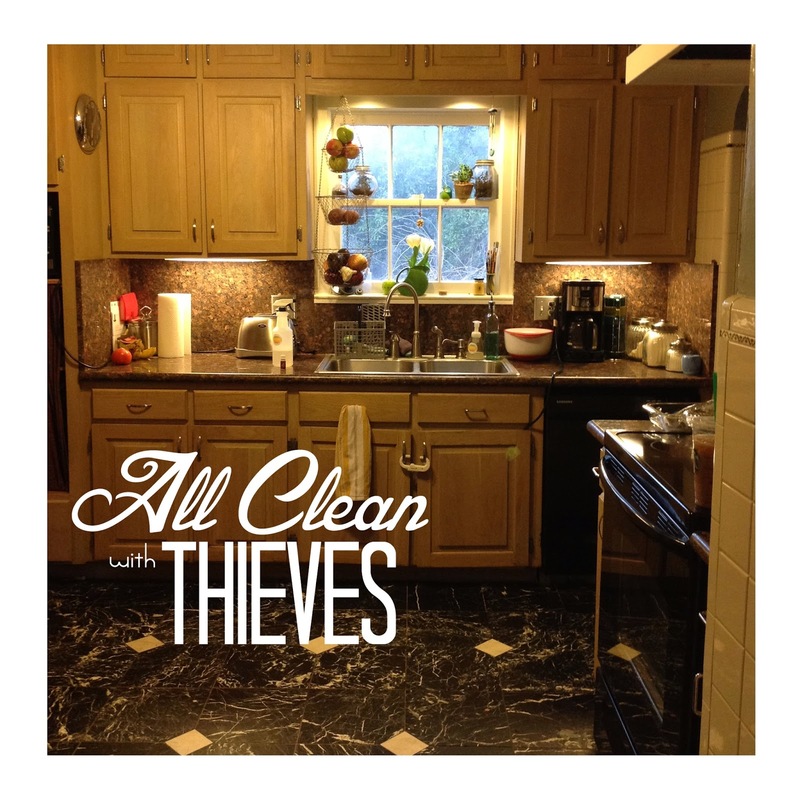 I even cleaned my stainless refrigerator with my trusty bottle of Thieves cleaner. Sparkly clean! Lastly, I swept and mopped the floors. On some of my floors, I like to use my steam mop, but the kitchen needed a little more work, so I mixed up a solution in the sink of water, vinegar and Thieves cleaner (2 capfuls of Thieves cleaner, 1 cup of vinegar, and filled the rest with water). I use a slightly abrasive sponge mop on the marble floors and it works like a charm! Not only does my kitchen sparkle, but my entire house smells clean and fresh. Plus, no asthma problems, no headaches and as an added bonus, because the cleaner is made with essential oils, we are actually getting health BENEFITS from using cleaners in our home. A complete opposite of our old way of cleaning. If there weren't pictures , I wouldn't believe how amazing the result after that easy cleaning could be! Thank you for sharing! Thank you for these wonderful ideas, pictures and cleaning recipes!! Just what I was looking for!